"Taiwanese language" redirects here. For other languages spoken in Taiwan, see Languages of Taiwan. For the aboriginal languages of Taiwan, see Formosan languages. For other uses, see Taiwanese language (disambiguation). Republic of China (Taiwan) also statutory status in Taiwan as one of the languages for public transport announcements and for the naturalization test. Taiwanese Hokkien (/ˈhɒkiɛn, hɒˈkiːɛn/;[note 1] Chinese: 臺灣閩南語; Pe̍h-ōe-jī: Tâi-oân Bân-lâm-gú; translated as Taiwanese Min Nan), also known simply as Taiwanese (臺灣話; Tâi-oân-oē / 臺灣語; Tâi-oân-gú), is a variety of Hokkien Chinese spoken natively by about 70% of the population of Taiwan. It is spoken by the Taiwanese Hoklo people, who descended from immigrants from southern Fujian during the Qing dynasty. The Pe̍h-ōe-jī (POJ) romanization is a popular orthography for this variant of Hokkien. Taiwanese Hokkien is a branched-off variety of Hokkien, a group of Southern Min dialects. Like many Min varieties, it has distinct literary and colloquial layers of vocabulary, often associated with formal and informal registers respectively. The literary layer can be traced to the late Tang dynasty, and can thus be related to Middle Chinese. In contrast, the colloquial layers of Min varieties are believed to have branched from the mainstream of Chinese around the time of the Han dynasty. Regional variations within Taiwanese may be traced back to Hokkien variants spoken in Southern Fujian, specifically those from Quanzhou and Zhangzhou, then later Amoy. Taiwanese Hokkien also contains loanwords from Japanese and the native Formosan languages. Recent work by scholars such as Ekki Lu, Sakai Toru, and Lí Khîn-hoāⁿ (also known as Tavokan Khîn-hoāⁿ or Chin-An Li), based on former research by scholars such as Ông Io̍k-tek, has gone so far as to associate part of the basic vocabulary of the colloquial Taiwanese with the Austronesian and Tai language families; however, such claims are controversial. The literary form of Hokkien once flourished in Fujian and was brought to Taiwan by early emigrants. Tale of the Lychee Mirror, a manuscript for a series of plays published during the Ming dynasty in 1566, is one of the earliest known works. This form of the language is now largely extinct. However, literary readings of the numbers are used in certain contexts such as reciting telephone numbers (see Literary and colloquial readings of Chinese characters). During Yuan dynasty, Quanzhou, Fujian province became a major international port for trade with the outside world. From that period onwards, due to political and economic reasons, many people from Hokkien-speaking regions (southern Fujian) started to emigrate overseas. This included the relatively undeveloped island of Formosa, starting around 1600. They brought with them their native language, Hokkien. During the late Ming dynasty, due to political chaos, there was increased migration from southern Fujian and eastern Guangdong to Taiwan. The earliest immigrants who were involved in the development of Taiwan included pirate-merchants Chinese Peter [zh] and Zheng Zhilong. In 1621, Chinese Peter and his forces, hailing from Zhangzhou, occupied Ponkan (modern-day Beigang, Yunlin) and started to develop Tirosen (modern-day Chiayi). After the death of Peter and another pirate, Li Dan of Quanzhou, Zheng sought to dominate the Strait of Taiwan. By 1628, he had grown so powerful that the Ming court bestowed him the official title, "Patrolling Admiral". In 1624, the number of Chinese in the island was about 25,000. During the reign of Chongzhen Emperor (1627–1644), there were frequent droughts in the Fujian region. Zheng and a Chinese official suggested to send victims to Taiwan and provide "for each person three taels of silver and for each three people one ox". Although this plan was never carried out, the Zheng family maintained an interest in Taiwan that would have dire consequences for the Dutch, who ruled Taiwan as Dutch Formosa at the time. In 1624 and 1626, the Dutch and Spanish forces occupied the Tainan and Keelung areas, respectively. During the 40 years of Dutch colonial rule of Taiwan, many Han Chinese from the Quanzhou, Zhangzhou and Hakka regions of mainland China were recruited to help develop Taiwan. Because of intermingling with Siraya people as well as Dutch colonial rule, the Hokkien dialects started to deviate from the original Hokkien spoken in mainland China. In the 1661 Siege of Fort Zeelandia, Chinese general Koxinga expelled the Dutch and established the Kingdom of Tungning. Koxinga originated from the Quanzhou region. Chen Yonghua [zh], who was in charge of establishing the education system of Tungning, also originated from Quanzhou. Because most of the soldiers he brought to Taiwan came from Quanzhou, the prestige variant of Hokkien on the island at the time was the Quanzhou dialect. In 1683, Chinese admiral Shi Lang attacked Taiwan in the Battle of Penghu, ending the Tungning era and beginning Qing dynasty rule (until 1895). In the following years, in order to prevent people from rebelling, the Qing court instituted a ban on migration to Taiwan, especially the migration of Hakka people from Guangdong province, which led Hokkien to become a prestige language in Taiwan. “ In this place, the language is as birdcall – totally unintelligible! For example: for the surname Liú, they say ‘Lâu’; for Chén, ‘Tân’; Zhuāng, ‘Chng’; and Zhāng is ‘Tioⁿ’. My deputy’s surname Wú becomes ‘Ngô͘’. My surname Huáng does not even have a proper vowel: it is ‘N̂g’ here! It is difficult to make sense of this. The tone of Huang's message foretold the uneasy relationships between different language communities and colonial establishments over the next few centuries. The ban on migration to Taiwan was relaxed sometime after 1722 (and was completely removed in 1874). During the 200 years of Qing dynasty rule, thousands of immigrants from Fujian arrived yearly; the population was over one million in the middle of the 18th century. Civil unrest and armed conflicts were frequent. In addition to resistance against governments (both Chinese and later Japanese), battles between ethnic groups were also significant: the belligerents usually grouped around the language they used. History has recorded battles between Hakka speakers and Hokkien speakers; between these and the aborigines; and even between those who spoke different variants of Hokkien. In the early 20th century, the Hoklo people in Taiwan could be categorized as originating from Xiamen, Quanzhou, Zhangzhou, and Zhangpu. People from the former two areas (Quanzhou-speaking) were dominant in the north of the island and along the west coast, whereas people from the latter two areas (Zhangzhou-speaking) were dominant in the south and perhaps the central plains as well. Although there were conflicts between Quanzhou- and Zhangzhou-speakers in Taiwan historically, their gradual intermingling led to mixing of the two accents. Apart from Lukang city and Yilan County, which have preserved their original Quanzhou and Zhangzhou accents, respectively, almost every region of Taiwan now speaks a mixture of Quanzhou and Zhangzhou Hokkien. A similar phenomenon occurred in Xiamen (Amoy) after 1842 when the mixture of Quanzhou and Zhangzhou Hokkien displaced the Quanzhou dialect to yield the modern Amoy dialect. During the Japanese colonial rule of Taiwan, Taiwan began to hold Amoy Hokkien as its standard pronunciation; the Japanese called this mixture Taiwanese (臺灣語, Taiwango). After 1945, Amoy Hokkien and Taiwanese Hokkien began to diverge slightly. Proportion of languages used at home by residents aged 6 or over in Taiwan in 2010, sorted by birth year. The chart shows the tendency that speech communities of Taiwanese local languages are shifting to speak Mandarin. Later, in the 20th century, the conceptualization of Taiwanese is more controversial than most variations of Chinese because at one time it marked a clear division between the Mainlanders who arrived in 1949 and the pre-existing majority native Taiwanese. Although the political and linguistic divisions between the two groups have blurred considerably, the political issues surrounding Taiwanese have been more controversial and sensitive than for other varieties of Chinese. After the First Sino-Japanese War, due to military defeat to the Japanese, the Qing dynasty ceded Taiwan to Japan, causing contact with the Hokkien-speaking regions of mainland China to stop. During Japanese rule, Japanese became an official language in Taiwan, and Taiwanese Hokkien began to absorb large number of Japanese loanwords into its language. Examples of such loanwords (some which had in turn been borrowed from English) include piān-só͘ from benjo (便所, "toilet"), phêng from tsubo (坪, "pyeong", an areal measurement) (see also Taiwanese units of measurement), ga-suh from gasu (ガス, "gas"), o͘-tó͘-bái from ōtobai (オートバイ, "autobicycle”, motorcycle). All of these caused Taiwanese to deviate from Hokkien used elsewhere. During Kōminka of the late Japanese colonial period, the Japanese language appeared in every corner of Taiwan. The Second Sino-Japanese War beginning in 1937 brought stricter measures into force, and along with the outlawing of romanized Taiwanese, various publications were prohibited and Confucian-style private schools which taught Classical Chinese with literary Southern Min pronunciation – were closed down in 1939. Taiwanese Hokkien thus was reduced to a common daily language. After the handover of Taiwan to the Republic of China in 1945, there was brief cultural exchange with mainland China followed by further oppression. The Chinese Civil War resulted in another political separation when the Kuomintang (Chinese Nationalist Party) government retreated to Taiwan following their defeat by the communists in 1949. The influx of two million soldiers and civilians caused the population of Taiwan to increase from 6 million to 8 million. The government subsequently promoted Mandarin and banned the public use of Taiwanese as part of a deliberate political repression, especially in schools and broadcast media. In 1964 use of Taiwanese in schools or official settings was forbidden, and transgression in schools punished with beatings, fines and humiliation. Only after the lifting of martial law in 1987 and the mother tongue movement in the 1990s did Taiwan see a true revival in the Taiwanese language. Today, there are a large number of Taiwanese scholars dedicated to researching the language. Despite this, according to census data the number of people speaking Taiwanese continued to drop. The history of Taiwanese and the interaction with Mandarin is complex and at times controversial. Even the name is somewhat controversial. Some dislike the name "Taiwanese" as they feel that it belittles other languages spoken on the island such as Mandarin, Hakka, and the aboriginal languages. Others prefer the names Southern Min, Minnan or Hokkien as this views Taiwanese as a form of the Chinese variety spoken in Fujian province in mainland China. Others dislike those names for precisely the same reason. Taiwanese is referred to as "Formosan" on the United States Census and the American Community Survey. Wikimedia Commons has media related to Taiwanese pronunciation. Phonologically, Hokkien is a tonal language with extensive tone sandhi rules. Syllables consist maximally of an initial consonant, a vowel, a final consonant, and a tone. Unlike many other varieties of Chinese such as Mandarin and Cantonese, there are no native labiodental phonemes (i.e., [f]). Coronal affricates and fricatives become alveolo-palatal before /i/, that is, /dzi/, /tsi/, /tsʰi/, and /si/ are pronounced [dʑi], [tɕi], [tɕʰi], and [ɕi]. The consonant /dz/ may be realized as a fricative; that is, as [z] in most environments and [ʑ] before /i/. The voiced plosives (/b/ and /ɡ/) become the corresponding fricatives ([β] and [ɣ]) in some phonetic contexts. This is similar to begadkefat in Hebrew and a similar allophony of intervocalic plosive consonants and their fricatives in Spanish. The vowel ⟨o⟩ is akin to a schwa; in contrast, ⟨o͘⟩ (with dot) is more open. In addition, there are several diphthongs and triphthongs (for example, ⟨iau⟩). The consonants ⟨m⟩ and ⟨ng⟩ can function as a syllabic nucleus and are therefore included here as vowels. The vowels may be either plain or nasal: ⟨a⟩ is non-nasal, and ⟨aⁿ⟩ is the same vowel with concurrent nasal articulation. This is similar to French, Portuguese, Polish, and many other languages. There are two pronunciations of vowel ⟨o⟩. In the south (e.g., Tainan and Kaohsiung) it is [ə]; in the north (e.g., Taipei) it is [o]. Due to development of transportation and communication, both pronunciations are common and acceptable throughout the country. Taiwanese tones, close to Taipei values. Demonstration of the tones of Taiwanese: 衫 saⁿ, 短 té, 褲, khò͘, 闊 khoah, 人 lâng, 矮 é, 鼻 phīⁿ, 直 ti̍t. Tone sandhi rules do not apply in this sentence. See (for one example) the modern phonological analysis in Chiung (2003), which challenges these notions. For tones 4 and 8, a final consonant ⟨p⟩, ⟨t⟩, or ⟨k⟩ may appear. When this happens, it is impossible for the syllable to be nasal. Indeed, these are the counterpart to the nasal final consonants ⟨m⟩, ⟨n⟩, and ⟨ng⟩, respectively, in other tones. However, it is possible to have a nasal 4th or 8th tone syllable such as ⟨siaⁿh⟩, as long as there is no final consonant other than ⟨h⟩. In the dialect spoken near the northern coast of Taiwan, there is no distinction between tones number 8 and number 4 – both are pronounced as if they follow the tone sandhi rules of tone number 4. Tone number 0, typically written with two consecutive hyphens ⟨--⟩ before the syllable with this tone, is used to mark enclitics denoting the extent of a verb action, the end of a noun phrase, etc. A frequent use of this tone is to denote a question, such as in “Chia̍h-pá--bē?”, literally meaning ‘Have you eaten yet?’. This is realized by speaking the syllable with either a low-falling tone (3) or a low stop (4). The syllable prior to the ⟨--⟩ maintains its original tone. A syllable requires a vowel (or diphthong or triphthong) to appear in the middle. All consonants can appear at the initial position. The consonants ⟨p, t, k⟩ and ⟨m, n, ng⟩ (and some consider ⟨h⟩) may appear at the end of a syllable. Therefore, it is possible to have syllables such as ⟨ngiau⟩ (“(to) tickle”) and ⟨thng⟩ (“soup”). Schema of the tone sandhi rules in Taiwanese. The final syllable in a sentence, noun (including single syllable nouns, but not pronouns), number, time phrase (i.e., today, tomorrow, etc. ), spatial preposition (i.e., on, under), or question word (i.e., who, what, how). If the original tone number is 5, pronounce it as tone number 3 (Quanzhou/Taipei speech) or 7 (Zhangzhou/Tainan speech). If the original tone number is 7, pronounce it as tone number 3. If the original tone number is 3, pronounce it as tone number 2. If the original tone number is 2, pronounce it as tone number 1. If the original tone number is 1, pronounce it as tone number 7. If the original tone number is 8 and the final consonant is not h (that is, it is p, t, or k), pronounce it as tone number 4. If the original tone number is 4 and the final consonant is not h (that is, it is p, t, or k), pronounce it as tone number 8. If the original tone number is 8 and the final consonant is h, pronounce it as tone number 3. If the original tone number is 4 and the final consonant is h, pronounce it as tone number 2. There are a number of a single syllable words that undergo double tone sandhi, that is, they follow the tone change rule twice and are pronounced according to the second tone change. These syllables are almost always a 4th tone ending in -h, and include the words 欲 (beh), 佮 (kah), 閣 (koh), 才 (chiah), as well as the 3rd tone verb 去 khì. As a result of following the tone change rule twice, these syllables are all pronounced as tone number 1. If the original tone number is 5, pronounce it as tone number 7. If the original tone number is 7, pronounce it as tone number 7. If the original tone number is 2 or 3, pronounce it as tone number 1. If the original tone number is 8 and final consonant is h, pronounce it as tone number 7. If the original tone number is 5, pronounce it as tone number 5. If the original tone number is 7, pronounce it as tone number 1. If the original tone number is 8 and the final consonant is h, pronounce it as tone number 5. See Tiuⁿ (2001), Chiung (2003) and the work of Robert L. Cheng (鄭良偉; Tēⁿ Liông-úi) for modern linguistic approaches to tones and tone sandhi in Taiwanese. Modern linguistic studies (by Robert L. Cheng and Chin-An Li, for example) estimate that most (75% to 90%) Taiwanese words have cognates in other Chinese varieties. False friends do exist; for example, cháu means "to run" in Taiwanese, whereas the Mandarin cognate, zǒu, means "to walk". Moreover, cognates may have different lexical categories; for example, the morpheme phīⁿ means not only "nose" (a noun, as in Mandarin bí) but also "to smell" (a verb, unlike Mandarin). Among the apparently cognate-less words are many basic words with properties that contrast with similar-meaning words of pan-Chinese derivation. Often the former group lacks a standard Han character, and the words are variously considered colloquial, intimate, vulgar, uncultured, or more concrete in meaning than the pan-Chinese synonym. Some examples: lâng (person, concrete) vs. jîn (人, person, abstract); cha-bó͘ (查某, woman) vs. lú-jîn (女人, woman, literary). Unlike the English Germanic/Latin contrast, however, the two groups of Taiwanese words cannot be as strongly attributed to the influences of two disparate linguistic sources. Extensive contact with the Japanese language has left a legacy of Japanese loanwords (172 are recorded in the Ministry of Education's Dictionary of Frequently-Used Taiwan Minnan). Although a very small percentage of the vocabulary, their usage tends to be high-frequency because of their relevance to modern society and popular culture. Examples are: o͘-tó͘-bái from ōtobai (オートバイ, "autobike"/motorcycle) and pháng from pan (パン, "bread", itself a loanword from Portuguese). Grammatical particles borrowed from Japanese, notably te̍k from teki (的) and ka from ka (か), show up in the Taiwanese of older speakers. Whereas Mandarin attaches a syllabic suffix to the singular pronoun to make a collective form, Taiwanese pronouns are collectivized through nasalization. For example, i (he/she/it) and goá (I) become in (they) and goán (we), respectively. The -n thus represents a subsyllabic morpheme. Like all other varieties of Chinese, Taiwanese does not have true grammatical plurals. Unlike English, Taiwanese has two first-person plural pronouns. This distinction is called inclusive, which includes the addressee, and exclusive, which excludes the addressee. Thus, goán means we excluding you, while lán means we including you (similar to pluralis auctoris). The inclusive lán may be used to express politeness or solidarity, as in the example of a speaker asking a stranger "Where do we live? ", but meaning "Where do you live?". An audio sample for a simple sentence, meaning “Today that little girl came to our house to see me”. The syntax of Taiwanese is similar to southern Chinese varieties such as Hakka and Yue. The subject–verb–object sequence is typical as in, for example, Mandarin, but subject–object–verb or the passive voice (with the sequence object–subject–verb) is possible with particles. Take a simple sentence for example: ‘I hold you.’ The words involved are: goá (‘I’ or ‘me’), phō (‘to hold’), lí (‘you’). Subject–kā–object–verb: Another sentence of roughly equivalent meaning is Goá kā lí phō, with the slight connotation of ‘I take you and hold’ or ‘I get to you and hold’. Object hō͘ subject–verb (the passive voice): Then, Lí hō͘ goá phō means the same thing but in the passive voice, with the connotation of ‘You allow yourself to be held by me’ or ‘You make yourself available for my holding’. With this, more complicated sentences can be constructed: Goá kā chúi hō͘ lí lim (‘I give water for you to drink’: chúi means ‘water’; lim is ‘to drink’). This article can only give a few very simple examples on the syntax, for flavour. Linguistic work on the syntax of Taiwanese is still a (quite nascent) scholarly topic being explored. A selection of literary works (original and translated) in Taiwanese, in several orthographies. Taiwanese does not have a strong written tradition. Until the late 19th century, Taiwanese speakers wrote mostly in Classical Chinese. Among many systems of writing Taiwanese using Latin characters, the most used is called pe̍h-oē-jī (POJ) and was developed in the 19th century, while the Taiwanese Romanization System has been officially promoted since 2006 by Taiwan's Ministry of Education. (For additional romanized systems, see references in "Orthography in Latin characters", below.) Nonetheless, Taiwanese speakers nowadays most commonly write in Standard Chinese (Mandarin), though many of the same characters are also used to write Taiwanese. In most cases, Taiwanese speakers write using the script called Han characters as in Mandarin, although there are a number of special characters which are unique to Taiwanese and which are sometimes used in informal writing. Where Han characters are used, they are not always etymological or genetic; the borrowing of similar-sounding or similar-meaning characters is a common practice. Mandarin-Taiwanese bilingual speakers sometimes attempt to represent the sounds by adopting similar-sounding Mandarin Han characters. For example, the Han characters of the vulgar slang ‘khoàⁿ sáⁿ-siâu’ (看三小, substituted for the etymologically correct 看啥潲, meaning ‘What the hell are you looking at?’) has very little meaning in Mandarin and may not be readily understood by a Taiwanese monolingual, as knowledge of Mandarin character readings is required to fully decipher it. In 2007, the Ministry of Education in Taiwan published a list of 300 Han characters standardized for the use of writing Taiwanese and implemented the teaching of them in schools. In 2008, the ministry published a second list of 100 characters, and in 2009 added 300 more, giving a total of 700 standardized characters used to write uniquely Taiwanese Hokkien words. With increasing literacy in Taiwanese, there are currently more Taiwanese online bloggers who write Taiwanese Hokkien online using these standardized Chinese characters. Han characters are also used by Taiwan's Hokkien literary circle for Hokkien poets and writers to write literature or poetry in Taiwanese Hokkien. An issue of the Taiwan Church News, first published by Presbyterian missionaries in 1885. This was the first printed newspaper in Taiwan, and was written in Taiwanese, in the Latin orthography pe̍h-oē-jī. There are several Latin-based orthographies, the oldest being Pe̍h-oē-jī (POJ, meaning “vernacular writing”), developed in the 19th century. Taiwanese Romanization System (Tâi-ôan Lô-má-jī, Tâi-Lô) and Taiwanese Language Phonetic Alphabet (TLPA) are two later adaptations of POJ. Other 20th-century innovations include Daighi tongiong pingim (DT), Ganvsig daiuuan bhanlam ghiw tongiong pingimv (GDT), Modern Literal Taiwanese (MLT), Simplified MLT (SMLT), Phofsit Daibuun (PSDB). The last four employ tonal spelling to indicate tone without use of diacritic symbols, but letters instead. Twenty-four in all, including the obsolete ⟨ts⟩, which was used to represent the modern ⟨ch⟩ at some places. The additional necessities are the nasal symbol ⟨ⁿ⟩ (superscript ⟨n⟩; the uppercase form ⟨N⟩ is sometimes used in all caps texts, such as book titles or section headings), and the tonal diacritics. POJ was developed first by Presbyterian missionaries and later by the indigenous Presbyterian Church in Taiwan; they have been active in promoting the language since the late 19th century. Recently there has been an increase in texts using a mixed orthography of Han characters and romanization, although these texts remain uncommon. In 2006, the National Languages Committee (Ministry of Education, Republic of China) proposed an alphabet called ‘Tâi-ôan Lô-má-jī’ (‘Tâi-lô’, literally ‘romanized orthography for Taiwanese’). This alphabet reconciles two of the more senior orthographies, TLPA and POJ. The changes for the consonants involved using ⟨ts⟩ for POJ's ⟨ch⟩ (reverting to the orthography in the 19th century), and ⟨tsh⟩ for ⟨chh⟩. For the vowels, ⟨o͘⟩ could optionally represented as ⟨oo⟩. The nasal mark ⟨ⁿ⟩ could also be represented optionally as ⟨nn⟩. The rest of the alphabet, most notably the use of diacritics to mark the tones, appeared to keep to the POJ tradition. One of the aims of this compromise was to curb any increase of ‘market share’ for Daighi tongiong pingim/Tongyong Pinyin. It is unclear whether the community will adopt this new agreement. There was an orthography of Taiwanese based on the Japanese kana during Japanese rule. The Kuomintang government also tried to introduce an orthography in bopomofo. Note: The bopomofo extended characters in the zhuyin row require a UTF-8 font capable of displaying Unicode values 31A0–31B7 (ex. Code2000 true type font). Pe̍h-ōe-jī inscription at a church in Tâi-lâm commemorating Thomas Barclay. Many keyboard layouts and input methods for entering either Latin or Han characters in Taiwanese are available. Some of them are free-of-charge, some commercial. The Min Nan dialect group is registered per RFC 3066 as zh-min-nan. Taiwanese can be represented as ‘zh-min-nan-TW’. When writing Taiwanese in Han characters, some writers create ‘new’ characters when they consider it is impossible to use directly or borrow existing ones; this corresponds to similar practices in character usage in Cantonese, Vietnamese chữ nôm, Korean hanja and Japanese kanji. These are usually not encoded in Unicode (or the corresponding ISO/IEC 10646: Universal Character Set), thus creating problems in computer processing. All Latin characters required by pe̍h-oē-jī can be represented using Unicode (or the corresponding ISO/IEC 10646: Universal character set), using precomposed or combining (diacritics) characters. Prior to June 2004, the vowel [ɔ] akin to but more open than ⟨o⟩, written with a ‘dot above right’, was not encoded. The usual workaround was to use the (stand-alone; spacing) character ‘middle dot’ (U+00B7, ⟨·⟩) or less commonly the combining character ‘dot above’ (U+0307). As these are far from ideal, since 1997 proposals have been submitted to the ISO/IEC working group in charge of ISO/IEC 10646 – namely, ISO/IEC JTC1/SC2/WG2 – to encode a new combining character ‘dot above right’. This is now officially assigned to U+0358 (see documents N1593, N2507, N2628, N2699, and N2770). Font support has followed: for example, in Charis SIL. The prestige variant of Taiwanese Hokkien is the southern speech found in Tainan and Kaohsiung. Other major variants are the northern speech, the central speech (near Taichung and the port town of Lukang), and the northern (northeastern) coastal speech (dominant in Yilan). The distinguishing feature of the coastal speech is the use of the vowel ⟨uiⁿ⟩ in place of ⟨ng⟩. The northern speech is distinguished by the absence of the 8th tone, and some vowel exchanges (for example, ⟨i⟩ and ⟨u⟩, ⟨e⟩ and ⟨oe⟩). The central speech has an additional vowel [ɨ] or [ø] between ⟨i⟩ and ⟨u⟩, which may be represented as ⟨ö⟩. There are also a number of other pronunciation and lexical differences between the Taiwanese variants; the online Ministry of Education dictionary specifies these to a resolution of eight regions on Taiwan proper, in addition to Kinmen and Penghu. Concerning the fifth (rising) tone in normal sandhi patterns, the Quanzhou/Coastal/Northern dialects change to seventh (mid level) tone, whereas the Zhangzhou/"Mixed"/Southern dialects change to third (low falling) tone. Hokkien immigrants to Taiwan originated from Quanzhou prefecture (44.8%) and Zhangzhou prefecture (35.2%). The original phonology from these regions was spread around Taiwan during the immigration process. With the advanced development of transportation and greater mobility of the Taiwanese population, Taiwanese Hokkien speech has steered itself towards a mixture of Quanzhou and Zhangzhou speech, known as Chiang–Chôan-lām (漳泉濫, in Mandarin Zhāng–Quán làn). Due to different proportion of mixture, some regions are inclined more towards Quanzhou accent, while others are inclined more towards Zhangzhou accent. 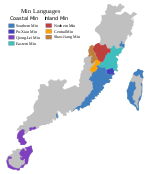 In general, Quanzhou accent is more common along the coastal region and is known as the hái-kháu accent; Zhangzhou accent is more common within the mountainous region of Taiwan and is known as the lāi-po͘ accent. The regional variation within Taiwanese Hokkien may be attributed to variations in the mixture of Quanzhou and Zhangzhou accents and/or lexicons. It ranges from Lukang accent (based on Quanzhou accent) on one end, to the northern coastal Yilan accent (based on Zhangzhou accent) on another end. Tainan, Kaohsiung and Taitung accents, on the other hand, are closest to the prestige accent. Both phian-hái and phian-lāi are intermediate dialects between hái-kháu and lāi-po͘, these also known as thong-hêng (通行腔) or "不泉不漳". In some ways this mixed dialect is similar to the Amoy dialect, which itself is a blend of Quanzhou and Zhangzhou speech. The common dialect refers to that which can be heard on radio, television, official announcements, etc. A great majority of people in Taiwan can speak both Mandarin Chinese and Taiwanese although the degree of fluency varies widely. There are however small but significant numbers of people in Taiwan, mainly but not exclusively Hakka and Mainlanders, who cannot speak Taiwanese fluently. A shrinking percentage of the population, mainly people born before the 1950s, cannot speak Mandarin at all, or learned to speak Mandarin later in life, though some of these speak Japanese fluently. Urban, working-class Hakkas as well as younger, southern-Taiwan Mainlanders tend to have better, even native-like fluency. Approximately half of the Hakka in Taiwan do speak Taiwanese. There are many families of mixed Hakka, Hoklo, and Aboriginal bloodlines. There is, however, a large percentage of people in Taiwan, regardless of their background, whose ability to understand and read written Taiwanese is greater than their ability to speak it. This is the case with some singers who can sing Taiwanese songs with native-like proficiency, but can neither speak nor understand the language. Which variant is used depends strongly on the context, and in general people will use Mandarin in more formal situations and Taiwanese in more informal situations. Taiwanese tends to get used more in rural areas, while Mandarin is used more in urban settings. Older people tend to use Taiwanese, while younger people tend to use Mandarin. In the broadcast media where Mandarin is used in many genres, soap opera, variety shows, and even some news programs can also be found in Taiwanese. Taiwanese is also perceived by some to have a slight masculine leaning, making it more popular among the males of the younger population. It is sometimes perceived as "unladylike" when spoken by the females of the younger population. Chhit-jī-á (literally, "that which has seven syllables") is a poetic meter where each verse has 7 syllables. There is a special form of musical/dramatic performance koa-á-hì: the Taiwanese opera; the subject matter is usually a historical event. A similar form pò͘-tē-hì (glove puppetry) is also unique and has been elaborated in the past two decades into impressive televised spectacles. See Taiwanese cuisine for names of several local dishes. A collection of translations of the Bible in Taiwanese. Top left, Today’s Taiwanese version; top right, the Red-Cover Bible; bottom, Barclay's translation. As with many other languages, the translations of the Bible in Taiwanese marked milestones in the standardization attempts of the language and its orthography. The first translation of the Bible in Amoy or Taiwanese in the pe̍h-ōe-jī orthography was by the first missionary to Taiwan, James Laidlaw Maxwell, with the New Testament Lán ê Kiù-chú Iâ-so͘ Ki-tok ê Sin-iok published in 1873 and the Old Testament Kū-iok ê Sèng Keng in 1884. A copy of Barclay's Amoy translation, opened to the Proverbs. The next translation of the Bible in Taiwanese or Amoy was by the missionary to Taiwan, Thomas Barclay, carried out in Fujian and Taiwan. A New Testament translation was completed and published in 1916. The resulting work containing the Old and the New Testaments, in the pe̍h-ōe-jī orthography, was completed in 1930 and published in 1933 as the Amoy Romanized Bible (Pe̍h-ōe-jī: Sin-kū-iok ê Sèng-keng) (on Hokkien Wikipedia). This edition was later transliterated into Han characters and published as 聖經台語漢字本; Sèng-keng Tâi-gí Hàn-jī Pún (on Hokkien Wikipedia) in 1996. A page from the Red-Cover Bible. The Ko-Tân (Kerygma) Colloquial Taiwanese Version of the New Testament (Sin-iok) in pe̍h-ōe-jī, also known as the Red Cover Bible [zh-min-nan] (Âng-phoê Sèng-keng), was published in 1973 as an ecumenical effort between the Protestant Presbyterian Church in Taiwan and the Roman Catholic mission Maryknoll. This translation used a more modern vocabulary (somewhat influenced by Mandarin), and reflected the central Taiwan dialect, as the Maryknoll mission was based near Tâi-tiong. It was soon confiscated by the Kuomintang government (which objected to the use of Latin orthography) in 1975. A decree (1955) banning the use of Pe̍h-ōe-jī, a Latin orthography for Taiwanese Hokkien, in church. Until the 1980s, the use of Taiwanese, along with all varieties other than Mandarin, was discouraged by the Kuomintang through measures such as banning its use in schools and limiting the amount of Taiwanese broadcast on electronic media. These measures were removed by the 1990s, and Taiwanese became an emblem of localization. Mandarin remains the predominant language of education, although there is a "mother tongue" language requirement in Taiwanese schools which can be satisfied with student's choice of mother tongue: Taiwanese, Hakka, or aboriginal languages. Although the use of Taiwanese over Mandarin was historically part of the Taiwan independence movement, the linkage between politics and language is not as strong as it once was. Some fluency in Taiwanese is desirable for political office in Taiwan for both independence and unificationist politicians. At the same time even some supporters of Taiwan independence have played down its connection with Taiwanese language in order to gain the support of the Mainlanders and Hakka people. James Soong restricted the use of Taiwanese and other local tongues in broadcasting while serving as Director of the Government Information Office earlier in his career, but later became one of the first politicians of Mainlander origin to use Taiwanese in semi-formal occasions. [improper synthesis?] Since then, politicians opposed to Taiwanese independence have used it frequently in rallies, even when they are not native speakers and speak it poorly. Conversely, politicians who have traditionally been identified with Taiwan independence have used Mandarin on formal occasions and semi-formal occasions such as press conferences. An example of the latter is former President Chen Shui-bian who uses Mandarin in all official state speeches, but uses mainly Taiwanese in political rallies and some informal state occasions such as New Year greetings. The current President of Taiwan (DPP) and Dr. Tsai Ing-wen has been criticized by her supporters for not using Taiwanese in speeches. Former President Ma Ying-jeou spoke in Taiwanese during his 2008 Double Ten Day speech when he was talking about the state of the economy in Taiwan. In the early 21st century, there are few differences in language usage between the pro-reuinification leaning Pan-Blue Coalition and the independence leaning Pan-Green Coalition. Both tend to use Taiwanese Hokkien at political rallies and sometimes in informal interviews, and both tend to use Mandarin at formal press conferences and official state functions. Both also tend to use more Mandarin in Northern Taiwan and more Taiwanese in Southern Taiwan. However, at official party gatherings (as opposed to both Mandarin-leaning state functions and Taiwanese-leaning party rallies), the DPP tends to use Taiwanese while KMT and PFP tend to use Mandarin. The Taiwan Solidarity Union, which advocates a strong line on Taiwan independence, tends to use Taiwanese even in formal press conferences. In speaking, politicians will frequently code switch. In writing, almost everyone uses vernacular Mandarin which is further from Taiwanese, and the use of semi-alphabetic writing or even colloquial Taiwanese characters is rare. Despite these commonalities, there are still different attitudes toward the relationship between Taiwanese and Mandarin. In general, while supporters of Chinese reunification believe that all languages used on Taiwan should be respected, they tend to believe that Mandarin should have a preferred status as the common working language between different groups. Supporters of Taiwanese independence tend to believe that either Taiwanese should be preferred or that no language should be preferred. In 2002, the Taiwan Solidarity Union, a party with about 10% of the Legislative Yuan seats at the time, suggested making Taiwanese a second official language. This proposal encountered strong opposition not only from Mainlander groups but also from Hakka and aboriginal groups who felt that it would slight their home languages, as well as others including Hoklo who objected to the proposal on logistical grounds and on the grounds that it would increase ethnic tensions. Because of these objections, support for this measure is lukewarm among moderate Taiwan independence supporters, and the proposal did not pass. In 2003, there was a controversy when parts of the civil service examination for judges were written in characters used only in Taiwanese. After strong objections, these questions were not used in scoring. As with the official-language controversy, objections to the use of Taiwanese came not only from Mainlander groups, but also Hoklo, Hakka and aborigines. The Control Yuan later created a rule that only allowed Standard Mandarin characters on civil service exams. According to public opinion surveys in 2008, more people supported making English a second official language than do Taiwanese. In 2017, aboriginal languages were given official status in Taiwan, as was the Hakka language. As of 2018[update], English is planned to become an official language in Taiwan. Taiwanese Hokkien is required for some activities but not others. For further information, see Languages of Taiwan. Taiwanization developed in the 1990s into a ‘mother tongue movement’ aiming to save, preserve, and develop the local ethnic culture and language of Holo (Taiwanese Hokkien), Hakka, and aborigines. The effort to save declining languages has since allowed them to flourish. In 1993, Taiwan became the first country in the world to implement the teaching of Taiwanese Hokkien in schools. By 2001, Taiwanese languages such as Taiwanese Hokkien, Hakka, and aboriginal languages were taught in all Taiwanese schools. [not in citation given][dubious – discuss] Since the 2000s, elementary school students are required to take a class in either Taiwanese Hokkien, Hakka or aboriginal languages. In junior high this is usually an available elective. Taiwan also has its own literary circle whereby Hokkien poets and writers compose poetry and literature in Taiwanese Hokkien on a regular basis. As a result of the mother tongue movement, Taiwan has emerged as a significant cultural hub for Hokkien in the world in the 21st century. It also plans to be the major export center for Hokkien culture worldwide in the 21st century. Klöter's Written Taiwanese (cited below) has been described as "the most comprehensive English-language study of written Taiwanese". ^ They are the most common pronunciations while there is another one cited from OxfordDictionaries.com, /hoʊˈkiːn/, which is almost never used actually. ^ "Draft national language development act clears legislative floor". focustaiwan.tw. ^ Hammarström, Harald; Forkel, Robert; Haspelmath, Martin, eds. (2017). "Taibei Hokkien". Glottolog 3.0. Jena, Germany: Max Planck Institute for the Science of Human History. ^ Table 6: Languages used at home for the resident nationals aged 6 years and over by gender and age, 2010 Population and Housing Census Archived 22 February 2015 at the Wayback Machine, Directorate General of Budget, Accounting and Statistics (DGBAS), ROC (Taiwan). ^ Dreyer, June Teufel (2003). "Taiwan's Evolving Identity". The Evolution of a Taiwanese National Identity (PDF). Asia Program Special Report. 114. Washington: Woodrow Wilson International Institute for Scholars. pp. 4–10. Retrieved 12 August 2016. ^ "Chinese, Min Nan". Ethnologue. Retrieved 12 June 2018. ^ Mei, Tsu-lin (1970). "Tones and Prosody in Middle Chinese and The Origin of The Rising Tone". Harvard Journal of Asiatic Studies. 30: 86–110. doi:10.2307/2718766. JSTOR 2718766. ^ Norman, Jerry (1991b). "The Mǐn dialects in historical perspective". In Wang, William S.-Y. (ed.). Languages and Dialects of China. Journal of Chinese Linguistics Monograph Series. 3. Chinese University Press. pp. 325–360. JSTOR 23827042. OCLC 600555701. ^ Ting, Pang-Hsin (1983). "Derivation time of colloquial Min from Archaic Chinese". Bulletin of the Institute of History and Philology. 54 (4): 1–14. ^ Baxter, William H.; Sagart, Laurent (2014). Old Chinese: A New Reconstruction. Oxford University Press. pp. 33, 79. ISBN 978-0-19-994537-5. ^ Andrade, Tonio (2005). "Chapter 2: A Scramble for Influence". How Taiwan Became Chinese: Dutch, Spanish, and Han Colonization in the Seventeenth Century. Columbia University Press. §20-1. ^ Davidson (1903), p. 13. ^ Davidson (1903), p. 561. ^ Davidson (1903), p. 591. ^ a b Ang (1987). ^ Iûⁿ, Ún-giân; Tiuⁿ, Ha̍k-khiam; Lu, Bichhin (1 March 2008). 台語文運動訪談暨史料彙編 (in Chinese). Taipei: 國史館. ISBN 9789860132946. OCLC 813921186. ^ a b c Sources: http://www.dgbas.gov.tw/public/data/dgbas04/bc6/census022%28final%29.html 2010 population and housing census by DGBAS, Executive Yuan. ^ Klöter (2005), p. 135. ^ Ang, Ui-jin (1991). 臺灣方言之旅. Taipei: 前衛出版社. ISBN 9789579512312. ^ Lin, Alvin (1999). "Writing Taiwanese: The Development of Modern Written Taiwanese" (PDF). Sino-Platonic Papers (89). OCLC 41879041. ^ Sandel, Todd L. (2003). "Linguistic capital in Taiwan: The KMT's Mandarin language policy and its perceived impact on language practices of bilingual Mandarin and Tai-gi speakers". Language in Society. Cambridge University Press. 32 (4). doi:10.1017/S0047404503324030. JSTOR 4169285. ^ "Census Data / API Identities - Research & Statistics - Resources Publications Research Statistics - Asian Pacific Institute on Gender-Based Violence". www.api-gbv.org. ^ Wu (2000), p. 2691. ^ Philip T. Lin (31 January 2015). Taiwanese Grammar: A Concise Reference. Greenhorn Media. ISBN 978-0-9963982-1-3. ^ "Robert L. Cheng". Center for Chinese Studies, University of Hawaii. 2003. Archived from the original on 24 June 2007. ^ 臺灣閩南語常用詞辭典-外來詞 [Dictionary of Frequently-Used Taiwan Minnan - Loanwords] (in Chinese). Ministry of Education, R.O.C. 2011. Retrieved 8 July 2011. ^ "臺灣閩南語羅馬字拼音方案 (Orthographic system for the Minnan language in Taiwan, 'Tâi-ôan Lô-má-jī')" (PDF). ^ Ang Ui-jin (2013). "Táiwān de yǔzhǒng fēnbù yǔ fēnqū" 台灣的語種分布與分區 [The Distribution and Regionalization of Varieties in Taiwan] (PDF). Language and Linguistics (in Chinese). Academia Sinica. 14 (2): 315–369. Map 5, p. 355. ^ 方言差»語音差異表 [Table of Pronunciation Differences]. 臺灣閩南語常用詞辭典 (in Chinese). Ministry of Education, R.O.C. 2011. Retrieved 8 July 2011. ^ 方言差»詞彙差異表 [Table of Vocabulary Differences]. 臺灣閩南語常用詞辭典 (in Chinese). Ministry of Education, R.O.C. 2011. Retrieved 8 July 2011. ^ Richards, Jack C. (1 January 1977). "Variation In Singapore English". Interlanguage Studies Bulletin. 2 (2): 131–151. JSTOR 43135170. ^ "Jordan: Pronouncing Romanized Taiwanese Hokkien". pages.ucsd.edu. ^ Klöter (2005), p. 4. ^ 本土聖經 (in Chinese). Retrieved 14 July 2008. ^ 書評『聖經－－台語漢字本』 (in Japanese). Archived from the original on 20 January 2008. Retrieved 14 July 2008. ^ "台語信望愛 - 4.1.4 《台語漢字本》". tailo.fhl.net (in Chinese). ^ "台語聖經". www.biblesociety-tw.org (in Chinese). ^ 蔡英文不說台語 高雄人涼了半截 [Tsai Ing-wen doesn't speak Taiwanese; The people in Kaohsiung feel half-disappointed] (in Chinese). Archived from the original on 28 December 2008. Retrieved 12 October 2008. ^ Lin Mei-chun (10 March 2002). "Hokkien should be given official status, says TSU". Taipei Times. p. 1. ^ Ko Shu-ling (20 September 2004). "Control Yuan sets rules for future examinations". Taipei Times. p. 2. ^ Gijsen, Johan; Liu Yu-Chang (2008). "Chapter 8: The Quest for a New Civic and Linguistic Identity: Mandarin and English Encroachment upon the Taiwanese Language". In Abdullah, Faiz Sathi; Abdullah, Mardziah Hayati; Hoon, Tan Bee (eds.). Critical Perspectives on Language and Discourse in the New World Order. Newcastle: Cambridge Scholars. p. 156. ISBN 9781847183408. ^ "President lauds efforts in transitional justice for indigenous people". Focus Taiwan. Retrieved 19 July 2017. ^ Cheng, Hung-ta; Chung, Jake (30 December 2017). "Hakka made an official language". Taipei Times. ^ "Taiwan to make English an official language next year, says official | Hong Kong Free Press HKFP". Hong Kong Free Press HKFP. 31 August 2018. Retrieved 5 September 2018. ^ 許嘉文 (15 March 2005). 台灣鄉土教育發展史 [The education history of local Taiwanese languages] (in Chinese). ^ "行政院全球資訊網". www.ey.gov.tw. Retrieved 5 December 2018. ^ "馬英九 | 馬蕭文化政策 | 國家政策研究基金會 | 公共政策的理性思辯與對話平台！". 國家政策研究基金會 (in Chinese). Retrieved 5 December 2018. ^ Snow (2004), p. 261. Ang, Ui-jin (1987). 臺灣河佬語聲調研究 (in Chinese) (4 ed.). Taipei: 自立晚報. ISBN 9789575960353. OCLC 813713530. Davidson, James W. (1903). The Island of Formosa, Past and Present : history, people, resources, and commercial prospects : tea, camphor, sugar, gold, coal, sulphur, economical plants, and other productions. London and New York: Macmillan. OCLC 1887893. OL 6931635M. Klöter, Henning (2005). Written Taiwanese. Wiesbaden: Harrassowitz. ISBN 9783447050937. Snow, D. (2004). Cantonese as Written Language: The Growth of a Written Chinese Vernacular. Hong Kong: Hong Kong University Press. ISBN 9789622097094. Wu, Soli (2000). 國臺對照活用辭典 [Mandarin-Taiwanese Comparative Living Dictionary] (in Chinese and Chinese). Taipei: Yuan-Liou. ISBN 9789573240884. OCLC 45990089. 李勤岸 (2005). 哈佛臺語101 [Harvard Taiwanese 101] (paperback & CD) (in English and Chinese). Translated by Yeh, Chieh-Ting; Lee, Marian. Tainan: 開朗. ISBN 9789868160811. Campbell, William (1913). A Dictionary of the Amoy Vernacular, spoken throughout the prefectures of Chin-chiu, Chiang-chiu and Formosa. Tainan: Taiwan Church Press. OCLC 867068660. Iâu Chèng-to: Cheng-soán Pe̍h-oē-jī (Concise Colloquial Writing). Tainan, Taiwan: Jîn-kong (an imprint of the Presbyterian Church in Taiwan). 1992. Tân, K. T: A Chinese-English Dictionary: Taiwan Dialect. Taipei: Southern Materials Center. 1978. Maryknoll Language Service Center: English-Amoy Dictionary. Taichung, Taiwan: Maryknoll Fathers. 1979. Zhao, Yihua (趙 怡華 Zhào Yíhuá): はじめての台湾語, 2003, ISBN 4-7569-0665-6 (Introduction to Taiwanese [and Mandarin]; in Japanese). Zheng, Zhenghao (鄭 正浩 Zhèng Zhènghào): 台湾語基本単語2000, 1996, ISBN 4-87615-697-2 (Basic vocabulary in Taiwanese 2000; in Japanese). Zhao, Yihua (趙 怡華 Zhào Yíhuá), Chen Fenghui (陳 豐惠 Chén Fēnghuì), Kaori Takao (たかお かおり Takao Kaori), 2006, 絵でわかる台湾語会話. ISBN 978-4-7569-0991-6 (Conversations in Taiwanese [and Mandarin] with illustrations; in Japanese). Chiung, Wi-vun Taiffalo (2003). "Tone Change in Taiwanese: Age and Geographic Factors" (PDF). University of Pennsylvania Working Papers in Linguistics. 8 (1). Archived from the original on 11 October 2013. LÎM, Chùn-io̍k (2014). "The Common Taiwanese Bible: A Means of Seeking to Affirm the Selfhood and Integrity of Taiwanese and Their Language". Journal of Taiwanese Vernacular. 6 (2): 106–9. doi:10.6621/JTV.2014.0602.05. Tan-Tenn, Henry H. (2001). "Taiwanese learning resources" (PDF). Archived from the original (PDF) on 18 April 2005. Tiuⁿ, Jū-hông (2001). 白話字基本論 : 臺語文對應&相關的議題淺說 [Principles of Pe̍h-oē-jī or the Taiwanese Orthography: an introduction to its sound-symbol correspondences and related issues] (in Chinese). Taipei: Crane. ISBN 957-2053-07-8. Cannings, Michael. "Introducing the Taiwanese Language". Tailingua. Mair, Victor H. (2003). "How to Forget Your Mother Tongue and Remember Your National Language". University of Pennsylvania. Retrieved 2 July 2011. 臺灣閩南語常用詞辭典 [Dictionary of Frequently-Used Taiwan Minnan] (in Chinese). Ministry of Education, R.O.C. 2011. Iûⁿ, Ún-giân. 台語線頂字典 [Taiwanese Online Character Dictionary] (in Chinese). "Maryknoll Taiwanese-English Dictionary and English-Amoy Dictionary". Maryknoll Language Service Center. This page was last edited on 18 April 2019, at 15:41 (UTC).